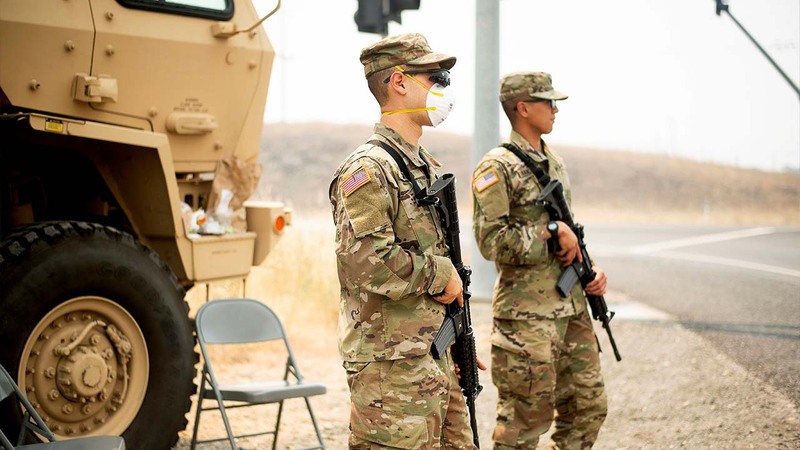 SACRAMENTO, Calif. -- California is calling in the National Guard for the first time next month to help protect communities from devastating fires like the one that largely destroyed the city of Paradise last fall. It's pulling the troops away from President Donald Trump's border protection efforts and devoting them to fire protection, another area where Trump has been critical of California's Democratic officials - even repeatedly threatening to cut off federal disaster funding. "They will be boots on the ground doing fuels projects alongside CalFire crews," Mohler said. "We've had them out for flood fighting, several different operations, but this would be the first time their mission would be fuels thinning and forest management." He referred questions about the latest effort to CalFire, which is directing the Guard's new assignment. The training is similar for firefighting and fire protection. Mohler said the troops also will receive some training in forest management, "so they're not just out there cutting brush" but understand why they're doing what they're doing. "CalFire is taking the Trump approach, logging the forest and weakening critical environmental protections, and that's the exact opposite of what we need to be doing," Center for Biological Diversity scientist Shaye Wolf said. CalFire this month listed 35 fuel-reduction projects it wants to start immediately, covering more than 140 square miles (362 square kilometers) - double the acreage in previous years. But state officials estimate 23,438 square miles (60,704 square kilometers) of California forestland need thinning or other restoration. "It's not a problem that's going to get fixed overnight," Mohler said. Moreover, investigations have often blamed recent wildfires on utilities not doing a good enough job of clearing vegetation around power lines and equipment. Democratic state Sen. Bill Dodd of Napa has proposed legislation that would require CalFire to tell utilities which trees and brush to remove and then inspect the work. Aside from Guard troops, CalFire also is creating 10 civilian fuels management crews this year. The 10-member crews could help with initial fire suppression if need be but will primarily reduce fuels, Mohler said. "It's going to be a pretty amazing sight to see as these crews get out there on the ground," he said. "There's hundreds of, unfortunately, Paradises cross the state, (so) the public needs to understand this."